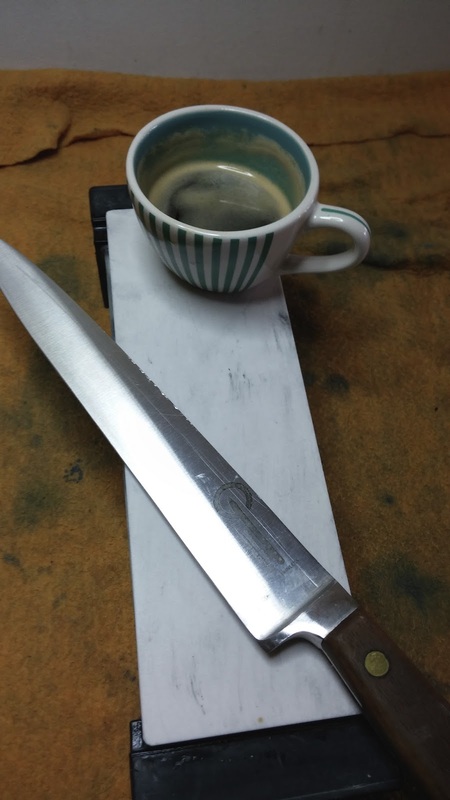 Knife Sharpening Using Traditional Methods: Lesson - What to expect. Lesson - What to expect. You're sick of your knife being dull and wondering what to do about it. MOST IMPORTANTLY, you feel the urge to sharpen your own knives. That is the real key, the fact that is dull and you'd have to pay someone to change that is relevant of course but you just want to learn. I applaud anyone who takes a knife sharpening lesson, it is a demonstration of commitment to the desire to learn. I promise you that if you learn to sharpen your own knives from a person who uses Japanese Water Stones, and you practice, you will be able to sharpen your kitchen knives and make them as sharp or as in most cases sharper, much sharper. That is about it if you want a lesson from me. Otherwise you may need a water stone(s) and a knife. 1. 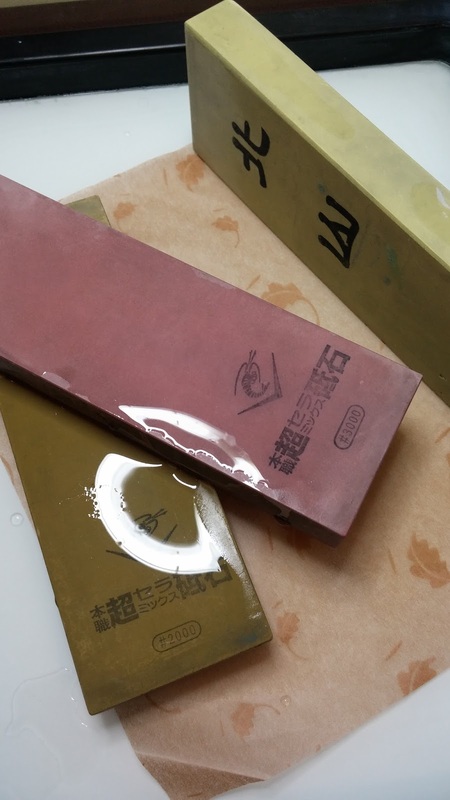 Japanese Water Stones, three in coarse/medium/fine grits. If three is not an option, then the coarse/medium stones and if only one stone the medium (1k) stone. That's really all you need, determination, ability to follow the instructor and really focus on technique is crucial. The sharpie in the picture is good to have and it's use would be explained. We start by talking about what makes knives dull in the first place, I don't mean what we do to cause the edge to feel dull but what is actually taking place with the edge of the knife, metal fatigue etc. I talk about primary edge and secondary bevel and what the process of sharpening involves, what we are trying to achieve. I try to visualize that as I sharpen, i.e. bring the two sides of the knives together perfectly at the Apex of the blade (the primary edge). I have a setup where I can sharpen beside the student so if he/she didn't bring any stones I have two 1,000 grit stones setup and I provide a demo in slow time and I continue to sharpen slowly beside the student so that he/she has a reference. I only do private lessons at my home so it is great, I can stop and monitor the work, check angles etc. and just talk about the entire process. 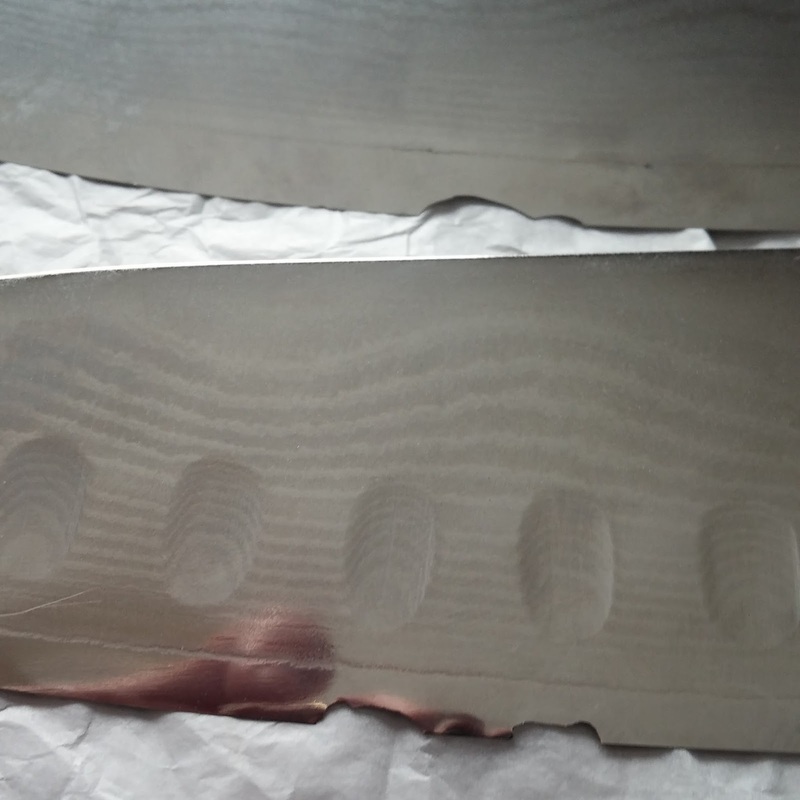 It is important to manage expectations and understand that it will take awhile before your knives are really sharp, i.e. sharper than new. Having said that, you won't leave until you are satisfied that you are on the right track and that the knives or knife you brought with you is sharper than when you came. Technique is so important, you need to establish a technique that you can repeat over and over, one that is comfortable and one that works. I show the technique I use of course, it is up to you to develop your own which can of course be the one I show you, a very common and effective technique. Now I stand when I sharpen so no sitting and no distractions either, you need to be able to work in an area that you can focus on what you doing, not having the TV on in the background or something similar. I also go over the importance of coarse water stones and we do some damage control on a knife with nicks in the edge. Of course we discuss Burr Formation and Burr Removal and angles and how to hold the knife and sharpening the tip. Maintenance is another element of knife sharpening and I show you how to use the stone to do that rather than with a Steel. It is actually a lot of fun and the 2-3 hours flies by. I really like it when the student gets back to me with questions or pictures of their work or where to purchase sharpening accessories. I think one of the areas I will improve on is the sharpening setup, how to set your place up to sharpen. I take it for granted that all you really need is a stone, a holder and some water and you are good to go. After seeing my setup however people are keen to duplicate something so I will work on that. The Stone Holders I have are quite expensive but you can buy one from Lee Valley for 20 dollars. I also invite students to come back in a month or so to see how they are doing and in case they have any questions that may have developed, I don't charge for this. Now if you run into something like this, I don't use my coarse stones to repair something this bad. Now the coarse stones will do the trick with patience and elbow grease and I have done it many many times. However for the sake of time, I use a belt sander with trizact belts to quickly and very uniformly work the edge so that I can get to the "bottom" of those holes and then I switch to the water stones to reset the bevels and sharpen the knife. Basically, all you need is the water stone, a 1k stone if you only have one and a holder for it. Now some folks just have their stone sitting on a piece of 2X4 over a container of water. They place a cloth under the stone to prevent it from slipping and this works as well. Don't get hung up (yet) on brands of stones and all the nifty accessories you can get like ponds and Shapton holders. Learn the basics, learn to make your knife sharp and have a setup which allows that. Then as your skill improves, and it will, you can decide how your own sharpening journey will unfold. You need to love the process though, don't be afraid to walk away from a knife if it is frustrating you. Professional Sharpening - My biggest challenge. Dream Knives and the stones to go with them.